Elder abuse is any action or inaction by self or others that jeopardizes the health or well-being of any older adult. Any senior can become a victim of elder abuse regardless of gender, race, ethnicity, income or education. The most common form of abuse is psychological, closely followed by material and or financial abuse. Abuse is more commonly inflicted upon women – of those being abused or neglected, up to 70 percent are female. Common signs of elder abuse include confusion, depression, anxiety, unexplained injuries, changes in hygiene, seeming fearful around certain people, and fear or worry when talking about money. Appallingly, family members commit a very high percentage of Elder Abuse and Neglect cases. For many, the thought of intentionally taking advantage of an aged relation, especially a parent who has cared for them as a child, is difficult to imagine. A good example of how an elderly family member might fall victim to financial and emotional abuse has been highlighted with the recent economic downturn, which has especially impacted seniors. In the case of Elder Abuse and Neglect, some seniors have been pressured emotionally into giving family members access to bank accounts, allowing relations to top up their own finances. Shame or guilt may stop a senior from revealing their abuse. Sometimes victims simply do not have the capacity to report it. 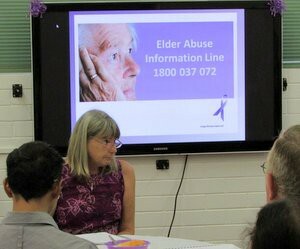 Whether a victim is unable or unwilling, some of the barriers to revealing elder abuse include: fear; love for the abuser; lack of understanding or impairment; unaware of resource options; or acceptance of abuse or neglect as normal behaviour. The Australian, State and Territory governments must tackle these serious and shocking Elder Abuse and Neglect statistics immediately. Urgent introduction of appropriate legislation to reflect the offences being committed against seniors and the very elderly must be put in place now to ensure safeguards are there for them.